ST. LOUIS, Mo. - Firefighters have contained a building fire in St. Louis that was at least a three-alarm fire, requiring 100 firefighters, three fire departments and a hazmat team on scene. According to CBS station KMOX in St. Louis, Mo., the fire broke out in a six-story commercial building around 11 a.m. Most of the fire was in the top two floors of the structure. There were no immediate reports of injuries. 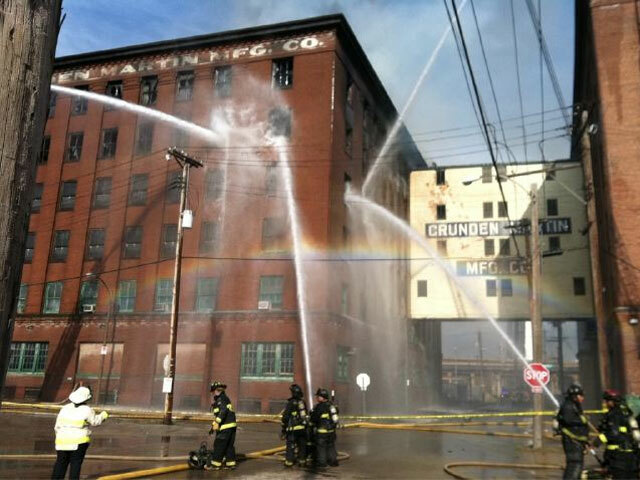 St. Louis Today reported that fire crews responded to reports of a fire and an explosion in the old Crunden Martin Manufacturing Co. complex. At one point firefighers were trying to battle the blaze from ladders outside the building, but it had got so intense that they had to retreat and use the cannons on the fire trucks. KTVI said that at one point, the fire had become a five-alarm fire, typically meaning an Assistant Chief and the Chief of Operations needed to be present at the site. Witnesses told St. Louis Today that they saw homeless people running from the building after the fire started, but authorities have not determined the cause of the blaze. Smoke was still eminating from the building at 12:45 p.m., but the flames appeared to have died down, according to St. Louis Today.